Successfully Added Mini DLP Projector - 0.3 Inch DMD, 150 Lumens, Up To 120 Inches Image, WVGA Resolutions, 1000:1 Contrast Ratio to your Shopping Cart. The perfect mini DLP Projector for Video Games, Movies or presentations with 150 Lumens, image projection up to 120 Inches and HDMI, AV, VGA as well as USB ports. If you’re looking for a compact home cinema projector or the perfect aid for your classroom or conference hall then your search is over. 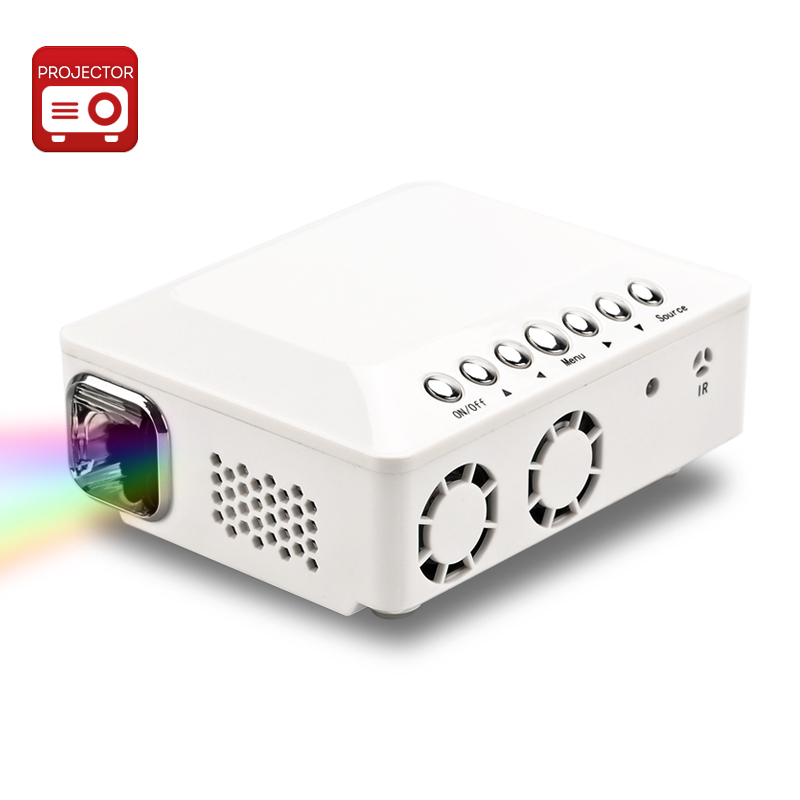 This mini DLP projector uses a 0.3 inch digital micromirror device or DMD for short. This contains many thousands of mirrors that are arranged in a rectangular array that corresponds to the number pixels in the image being displayed. Each one of these tiny mirrors is constantly being adjusted to bring you the perfect image in brilliant vibrant colors for every frame of footage being played. It’s able to cast a projection from as little as 15 inches all the way up to 120 inches so you can have full life characters and with 16:9 and 4:3 aspect ratios even your wide screen movies will look sumptuous. With VGA, AV, USB and HDMI ports you can hook this mini projector up to a full range of devices for enthralling gaming action to immersive movie watching or just sharing your latest holiday snaps. The built in speaker is sufficient for most uses but with an AV out port you can hook up additional speakers for added audio effects to create the perfect surround sound cinema experience. Portability isn’t an issue as this projector is exceptionally small so it’s easy to carry in your bag or pocket and the IR remote control will put you in charge from anywhere in the room so you can display masterful presentations at the touch of a button. 48 Hours delivery to New Zealand from placing order to arrival. Amazing. Used DHL freight option. Tested and more than satisfied with display. Will mainly use for teaching using power point slides some with sound. Purchased Yellow model - seems now to be sold out. But white and pink still available. No user manual but pretty intuitive use.